The Mya Washable Hose with a Metal Tip is perfect for anyone who wants a long lasting hookah hose with washable convenience and style. The wooden handle is elegant and perfectly shaped for ease of holding thanks to an artfully carved and polished design. 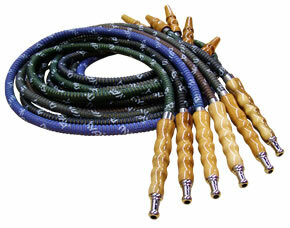 The metal tip is made of high quality metal and is certain to aid in a relaxing hookah session. 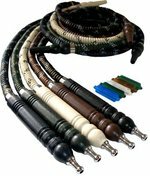 The hose is available in a wide variety of colors and may be washed with ease for convenient reuse without flavor contamination.